Turn Off the Radio Vol. 4 follows up to last year's Vol. 3 Pulse of the People with Green Lantern. Embodying the hip-hop duo's growth over the last decade, Revolutionary but Gangsta Grillz is a result of the journey they have endured being signed to two major labels, touring globally, releasing solo projects, and launching their full multi-media brand Boss Up, Inc. M-1 and Stic.man bring this refined perspective while still utilizing their traditional take over trademark of flipping mainstream hits as demonstrated with their first two leaks, which are spins on B.O.B's Nothing On You and Drake's Far From Over. "We wanted to just capture that love for hip hop. To give the people something for the summer that we could let folks know we still here, we doing well and we still growing," says Stic. "The hunger is there, the creativity is there, the flows are there, and the message is there. This is one of my favorite albums in the Turn off the Radio Series." Reflective of their journey, the project also pays homage to the same Dead Prez that emerged at dawn of the 21st Century on Loud Records, bringing a revolutionary political consciousness to mainstream hip-hop with songs like I'm An African and Police State. Their bold lyrics and style rapidly developed a stronghold that has kept them at the forefront and made them the go to political hip-hop group with an impact that has brought about work with Jay-Z, Dave Chapelle, Kanye West, presidential candidate Cynthia McKinney, and countless other artists, academics, and political figures. They have inspired everyone from Nas to T.I. to Drake with their outspoken political audacity and knack for shedding light on life struggles. Reeps One is Vauxhall Beatbox Championships winner once again. A report of the event will appear here later today, please keep checking back or fan us. Below are the results of the event with the winners of each round highlighted in bold. 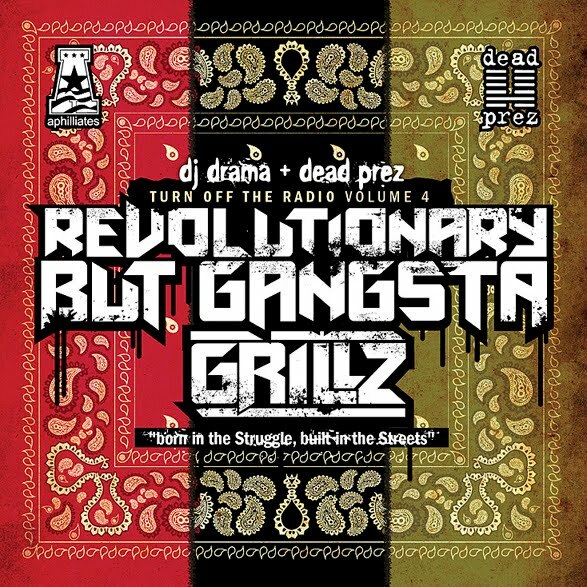 Celebrating the 10 year anniversary of their debut album, Let's Get Free, Take Over is Dead Prez's spin on Drake's infamous song Far From Over. Fully exuding their signature mastery of flipping mainstream hits, it is the latest release from Dead Prez's soon to be released Turn Off the Radio Vol. 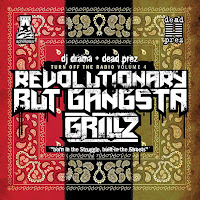 4 Revolutionary But Gangsta Grillz project with DJ Drama. Tommy Franzén has finished editing his showreel and uploaded it to YouTube. It mainly consists of clips from So You Think You Can Dance, although there are some other clips of the Pepsi Can Fu advert and his Breakin' Convention appearances that we included in his quick bio as well. I thought this might be of interest to readers as there are short clips of Tommy in Mamma Mia! which has been a popular search term over the past few months, so for everyone looking for those clips, enjoy! By the way, I should mention that Tommy will be appearing at Chingford Day Dance Festival on 4 July. Lizzie Gough who starred in So You Think You Can Dance as well as Blaze: The Streetdance Sensation with Tommy is also pencilled in, but not confirmed, yet. This compilation is the first ever to document the birth of disco in Philadelphia and the work of the unsung musicians who played on the numerous hits that came out from the Philadelphia scene. 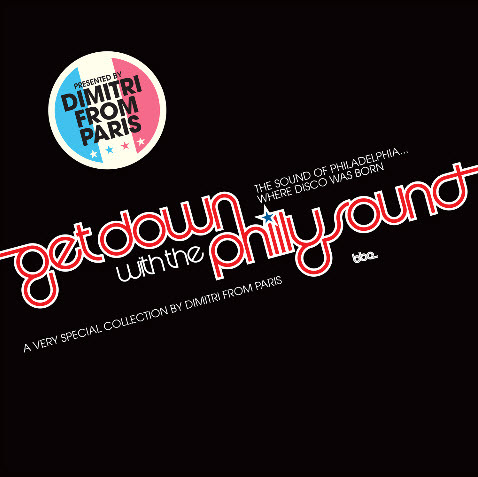 The compilation exclusively features five remixes and four edits by Dimitri from Paris. This release is a historical documentation of the birth of modern dance or nightclub music. Every remixer, DJ and dancefloor has been influenced by the content of this release. Gamble and Huff granted BBE access to multi track tapes for four tracks for Dimitri to create new mixes of their classic recordings. A Tom Moulton Mix in the style of his legendary Sandpiper mix tapes brought him to the attention of Philly International and Salsoul records and started off the remix, available exclusively from the BBE website using download codes available to physical copy purchases. The release will be accompanied by extensive liner notes, pictures, interviews and anecdotes from the legendary players involved in the music. Earl Young is founder of The Trammps and creator of the 4/4 disco drum pattern which laid the template for every dance record since. Recording engineer Joe Tarsia founded Sigma Sound in 1968, and virtually of all the disco recordings released on Philadelphia International, Salsoul, Philly World, Gold Mind and Atlantic were made at his studio. 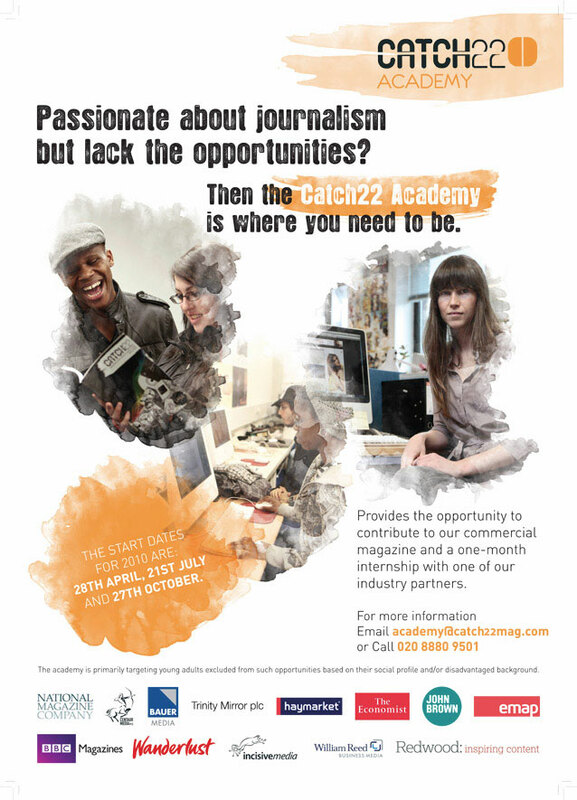 Catch 22 are the people behind my motivation as a journalist. Over a year ago, before TooMuchFlavour broke out of it's shell and screamed "Screw it, let's do it!" these guys were here to assist me with a helping hand into journalism. If it wasn't for them I might have packed writing in, but after 12 week's training with the academy, my attitude changed a lot. Interested in the world around you – from your local area to the opposite side of the globe? Love to communicate with people, in any, and every way possible? Recognise how contributing your unique perspective adds up to a well-formed world view? If you've answered yes to any of the above and are aged between 18-30, then boy have we got some good news for you. Catch 22 isn't just a really hip magazine that's distributed in London every three months. 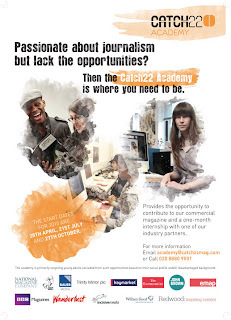 It's also a training academy where aspiring journalists can learn the trade from industry professionals for a tiny fee. The course is targeted at people who have little or no journalistic experience or training, and are struggling to get their foot in the door of a competitive industry. The Academy offers a basic grounding in print journalism, teaching trainees what to expect of the industry and how to make their mark. And if that's not enough of an incentive, Catch 22 is funded by media sponsors such as Trinity Mirror, Haymarket and The Economist. As well as providing financial support for the programme, the media partners also offer internships to trainees who have completed the Academy, providing an important first chance to shine. The deadline for applications to the April Academy cohort is midnight on 18th June. Shortlisted applicants will then be called for interviews at the Academy's headquarters in Seven Sisters, from which 12 students will be chosen. Add Catch 22 on Facebook and follow them on Twitter. A year ago, the first time I went to a beatboxing jam and knew very little about it, the host, Stig of the Dump, remarked that "this is a real beatboxing jam - some of you have only seen beatboxing watching Beardyman on YouTube!" Well truth be told... I hadn't seen Beardyman myself! To be fair, it was the first time I'd investigated beatboxing. All is about to change, however, as following Shlomo's run of Boxed there's not one but two more beatboxing performances as part of the E4 Udderbelly. Freestyle Project is bringing together beatboxing with slam poetry, emceeing, visuals and guitar for a hip hop mash-up of everything that makes organic hip hop so wonderful. As your eyes peruse the flyer, you'll see that Stig of the Dump is also in the line up, as is the poet Dizraeli whose talent I have mad respect for (apart from trying to put one past the audience at Shaking Spears). JFB, DMC Champion 2007, is on decks, and 'J'm Black, who I'd offend trying to pronounce his name, is on guitar. Throw a loop station into the mix and the result is going to be pretty cool! 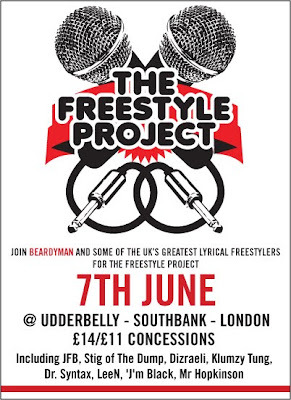 The Freestyle Project is on Monday 7 June 2010 at the Udderbelly by the Southbank Centre. Beardyman Unshaved is the second beatboxing event, a fortnight later on Monday 21. Prepare yourself for a standby ticket, as it's been entirely booked up! As crunch time approaches the judges seem to be on the offensive, particularly Simon Cowell with a "girls are going to hate you" remark. Ruby Girls are not through to the finals of Britain's Got Talent . Feel free to drop a comment below.